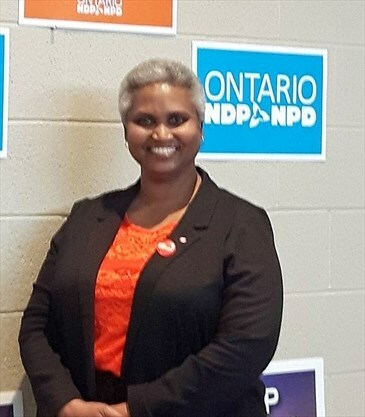 Last week we had the honour of electing our candidate to represent us in the upcoming election, Marjorie Knight! 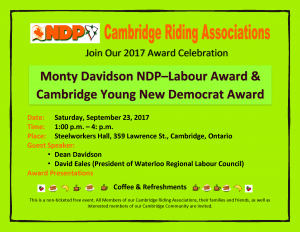 It was an excellent nomination, the room was packed, peopled were excited, and we heard heartfelt speeches from both our nominees. And as evidenced by the article in the Cambridge Times on Marjorie, people are extremely interested in what we are doing here in Cambridge. But now the easy part is over, and the election campaign officially begins. In this election we have the goal of talking with every single person in Cambridge-North Dumfries to spread our message, that’s almost 100,000 conversations that we need to have before election night; however to do that we need your help. We need our dedicated members to stand with us as we do everything we can to ensure that we send Marjorie to Queen’s park. As such, on behalf of team Marjorie I ask all of our members who are interested in volunteering with the campaign team to get in touch with us as soon as possible. It is only through the hard work of our membership can we hope to accomplish or goals in 2018. 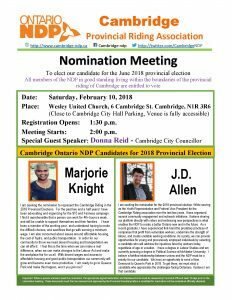 If you are interested in being involved please email me directly at mota.jordan91@gmail.com, or get in contact through our Facebook Page at Cambridge NDP.